“After update my iTunes to the latest version 12.3.3, all of my songs and playlists accidentally disappeared from my Mac, how can I get back them? MacBook Pro”. After updating iTunes to new version, some Mac users found their music are deleted and gone. In this case, how to get back them? The new iTunes may cannot find where your music files are stored on your Mac. So you should follow the steps below to let it know. Step 2. Drop iTunes Library.itl to another place for backup, and then go into Previous iTunes Libraries to get a latest iTunes library file to its parent folder. Step 3. Rename the latest iTunes library file to “iTunes library” to replace what you have dropped out. Step 4. Open iTunes to check whether it works to find back your deleted music files. If you have backed up your iTunes library by using TimeMachine, you can easily get back deleted songs and playlists. If you make sure that all of your songs and playlists are not on your Mac, but have been synced to your iPhone/iPad/iPod recently, you can rebuild your iTunes from your iOS device. Of course, iTunes can’t make it. You may need some professional transfer tool. What you have purchased on iTunes can be re-downloaded for free. Just cost you some times to download songs again. But your playlists may be gone forever, and you should create them manually. After getting one new iPhone, no matter it’s a bigger iPhone 6s Plus or smaller iPhone SE, most of iPhone users would like to transfer something to their iPhone from their computer, where they may have collected thousands of songs, videos and PDF books. For old iPhone users, transferring process would be familiar. However, sometimes, it could be hard for new iPhone users to understand how it work to sync files to iPhone. So we make this tutorial here. Step 1. Run iTunes, collect some MP3 files that you want to put to your new iPhone, and drag and drop them to music category of your iTunes firstly. Step 3. 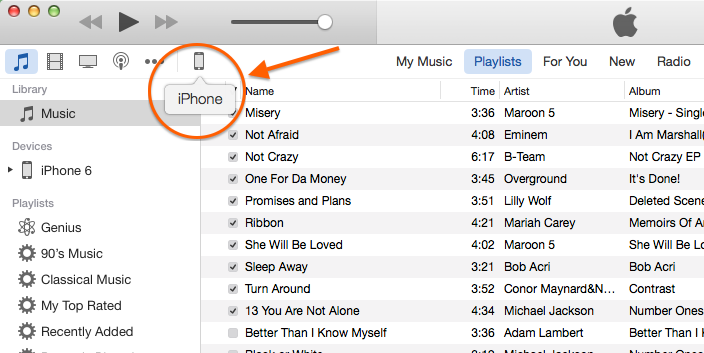 Under “Summary”, select “Music”, and you can turn on Music sync to put MP3 files to your iPhone. In this step, your iPhone Music will be erased and replaced. iTunes enables you to sync photos, movies, books to your iPhone, but some iOS incompatible files cannot be added to iTunes. In addition, you should know that iTunes allows you to sync with only one computer and iTunes cannot help you to get data off iPhone. So if you want to transfer in a simple way, sometimes, you may need professional transfer tool like AnyTrans to help you out. “When trying to sync photos to my iPhone 6 Plus on my Macbook Air with iTunes. I always get the following message: iTunes cannot sync photos to the iPhone because your Photos Library is not yet available. Please try again later. I’ve checked everything I can and can’t find any solutions. I don’t have this issue with my iPad.How do I fix this? iPhone 6 Plus, iOS 9.2.1, Sync with MacBook Air OS X 10.11.3”. One iPhone user PeterInParker questioned on Apple Support Communities. Actually, this is one common issue that many iPhone/iPad users have met before. And the causes of this problem are various, so the solutions are various, too. Below we show you some tips you can use if you drop into this problem and you cannot sync photos and videos from computer to your iPhone and iPad. (You can have a try, no matter what version of the iOS on your iPhone and iPad). Before you do as follows, you are suggested to backup your iPhone and iTunes library. Restart both of your computer and iOS device. Turn off iCloud Photo Library and My Photo Stream on iOS Device. Turn off iCloud Photo Library and My Photo Stream on computer. Update iOS, iTunes, Mac to latest version. You may have some other solutions, welcome you share them on the comment section! There is no unique and 100% correct solution to this issue. And you have to try and try. And sometimes it is not because of iTunes itself. After searching, we found one fix is the most useful, which is Go to Control Panel > Programs > Apple Software Update > Repair. And then reinstall iTunes 6464Steup.exe”. Of course, there are some other tips Apple suggests and you can try if the solution above doesn’t work. Install Latest Updates for Your Windows. Make Sure Your Windows Support iTunes 12.3. Restart Your Computer and Reinstall Again. You may have lost some data after updating iPhone to iOS 9.3/9.3.1 or iOS 9.2/9.1/9. In these situations, you may need a restore from iTunes backup to your device. But how to correctly restore from iTunes backup and what things you should know before having a restore. In this post, we will talk about this topic and offer tips to fix problem about you cannot restore from iTunes after updating to new iOS. The process to restore with iTunes is pretty simple. After connecting your iOS device to your computer, you could make it in 3 steps. Step 1. Open iTunes, go to File > Devices > Restore from Backup. Step 2. Select one suitable iTunes backup by analyzing the date and size. Of course, you can use some iTunes backup extractor, such as PhoneRescue to view the contents on each iTunes backup so that you can make a correct decision whether to restore from the iTunes backup. Step 3. Click Restore and wait for all process finished. Can’t Restore from iTunes backup in iOS 9/9.1/9.2/9.2.1/9.3 and How to Fix? when the iOS version of your device is older than your iTunes backup. when your want to transfer some data that not compatible with your device. For example, if the backup was created with an iPad, some iPad apps you backed up to iTunes couldn’t be transferred to iPhone. when you have no backup on iTunes, or the backup have no data, or corrupted. when your USB cable connection is bad. Tips to fix can’t restore iPhone iPad problem. Check the USB cable and make sure your connection is stable. Restart your device or force restart your iOS device, which is a basic tip that you can have a try. Just turn off and then turn on your device. Or hold on both “Power” and “Home” buttons for a few minutes and then turn on your device. Update iTunes and iPhone to latest version. Use iTunes backup extractor, such as PhoneRescue to directly get files from backup to computer without restoring. You may have some better idea about how to fix cannot restore from iTunes backup, just share and discuss it on the comment section. Can’t use iTunes Home Sharing to share songs after updating to iOS 8.4? Don’t worry, there are some alternatives to iTunes you could try to transfer songs between any Mac/PC and device, no matter it is iPhone, iPad, iPod touch or old iPod nano, classic. News reported Home Sharing for songs is gone missing in iOS 8.4, and this iTunes sharing feature is only limited to apple TV users now. And related complaints about iOS 8.4 home sharing came to Apple communities. Note: the new released iOS 9 get home sharing back for all iOS users. Some iTunes alternatives to Home sharing are necessary if you don’t want to use home sharing, Apple music – family plan or iTunes match. Such as AnyTrans, iTunes alternative to transfer media files (music, photos, videos etc) across any iPhone, iPad, iPod touch, mac and pc. 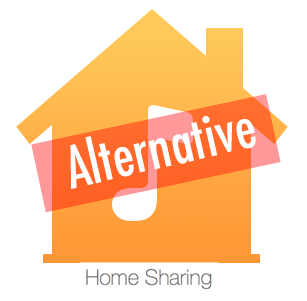 Welcome commenting to talk about iTunes Alternative of Home sharing.